It's been a while since I did a review on this blog. 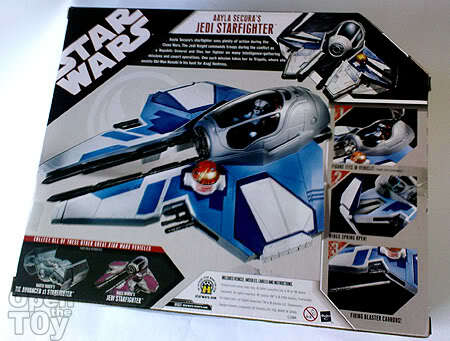 So today I'm going to give a detailed review on Aayla Secura's Jedi Starfighter. Prepare for tons of photos. 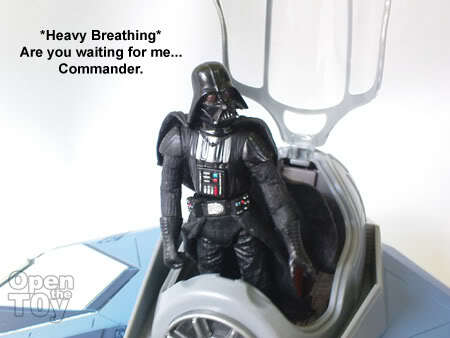 This toy was on offer for just only $25 SGD at a local retail shop in Chinatown. 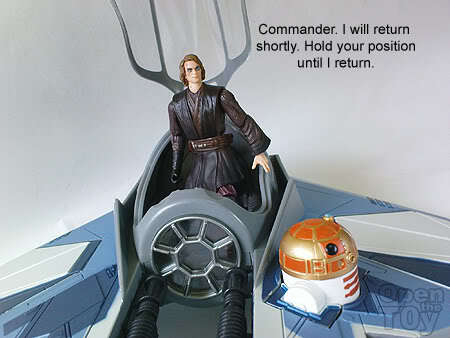 I always wanted one for my Anakin Skywalker so when I saw this offer, I jumped on it. 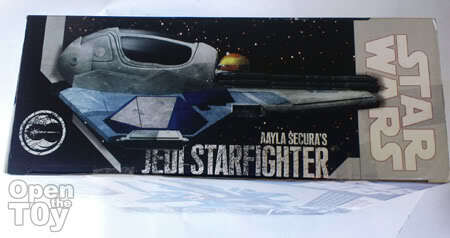 This Starfighter's packaging was well designed for Aayla Secura with her bluish color tone. 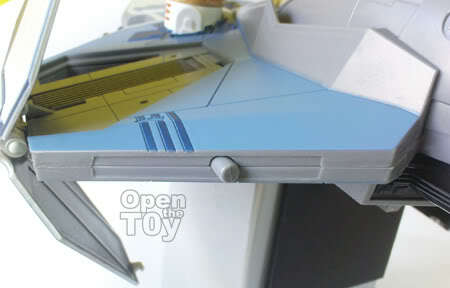 I like the neat box design very much as on the side, you can see the good looking Jedi Starfighter. 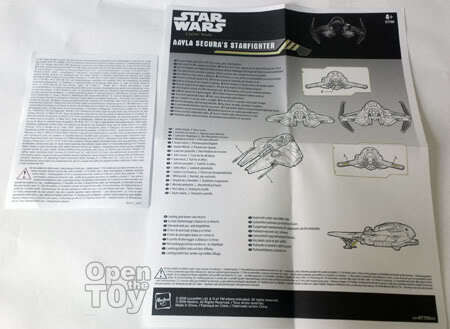 The back of the box listed the features of this toy and other toys of the same series. 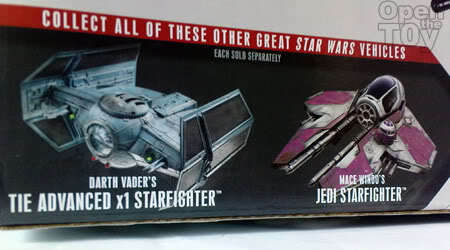 And the other toys in the same series were Darth Vader Tie Advance Starfighter and Mace Windo Jedi Starfighter. 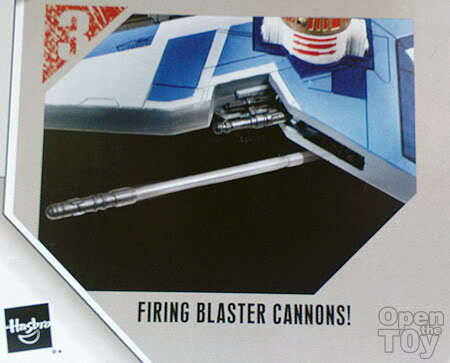 The 3 features of this toy were featured on the back of the box. The features do look interesting but can they promise what was being showed? We shall talk about it later. Time to OPEN THE TOY! Something dropped out as I open the toy... It is the instruction sheet with various languages printed on it. But nothing beats the Pictorial. 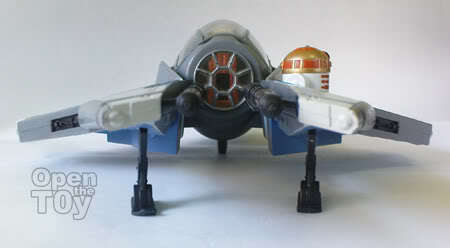 Jedi Starfighter look great at all angle. The first feature I tested was the opening of the cockpit. No problem there. A top view of the Cockpit you can see the neat and decent paint job. I like the metallic bronze seat very much. 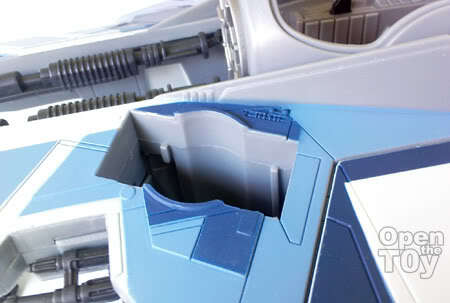 Unfortunately not all Starwars figure can seat comfortably in it. 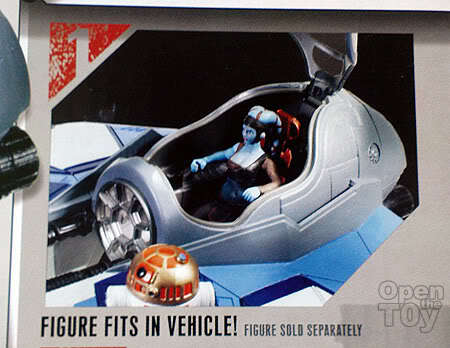 Due to some action figure features on some Jedi, they can never seat properly in it (You can see that later on when Anakin get into the cockpit). 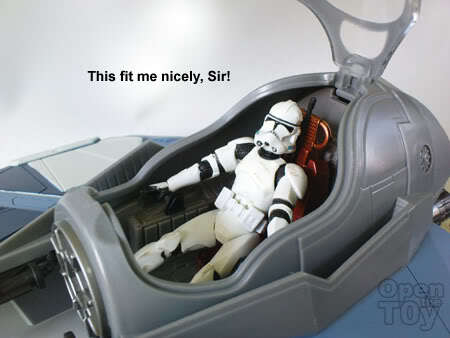 The only one that can seat decently in it was none other than Super articulate Clone Trooper. 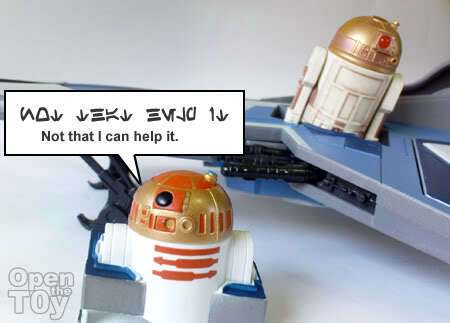 I'll move on to give some attention to the astromech droid, R4-G9. 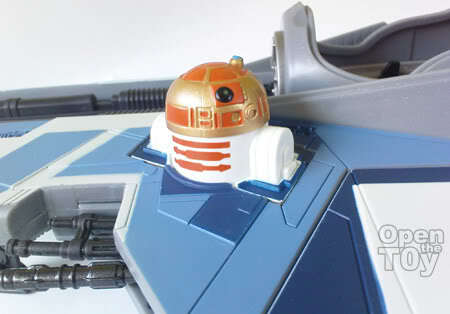 The head of the Droid can turn from side to side. 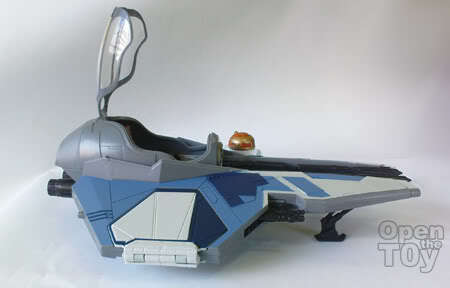 The paint job fits the Starfighter very well. We can remove R4 out of the Starfigther leaving a empty slot. 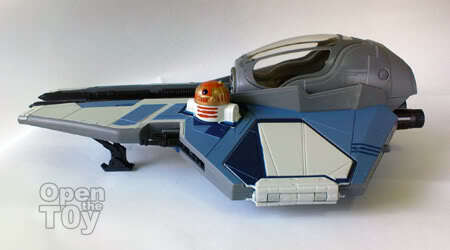 So, I was thinking perhaps a real R4-G9 can fit nicely in it.. 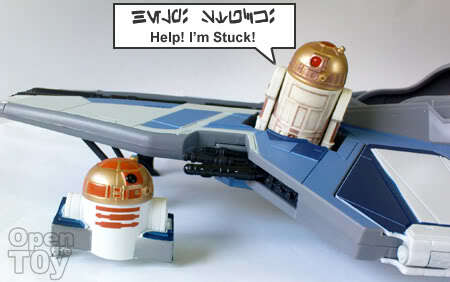 So what is that feature for removing the droid for? I'm as clueless as you. Now to battle mode! All hands on deck! 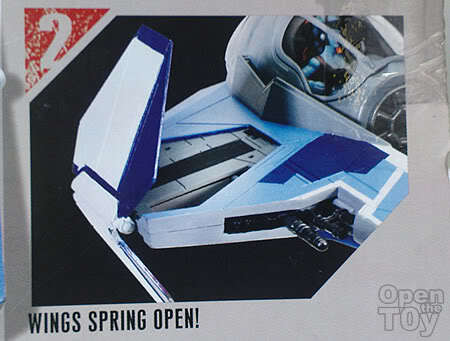 To expand the spring open the wings, you just need to press the button at the back of the Starfighter between the exhausts. 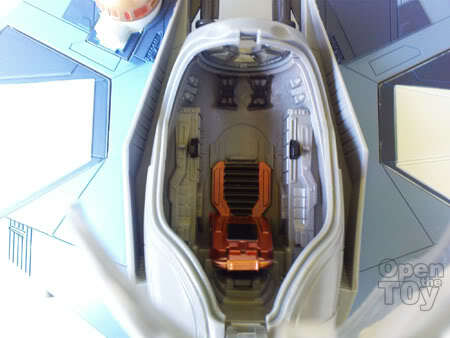 For the two toy missiles to be shot out, simply press the button on each side at the back of each wings. That's the fun part. 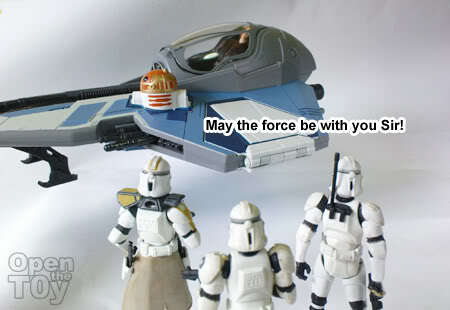 It is a cool vehicle, I have the Obi-Wan version. Did yours come with a sticker sheet? 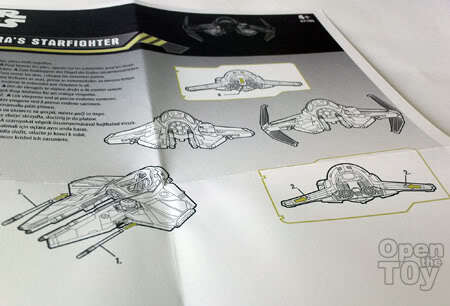 My star fighter does not come with any stickers. Was it suppose to come with it? If yes, I felt cheated! 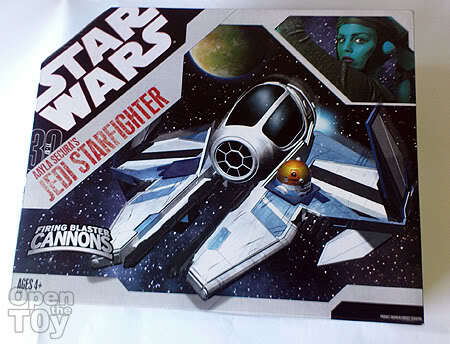 From what I can tell, the Aayla version of the starfighter doesn't come with stickers. Here in the States, it was a Target exclusive. Normally they try to do these on the cheap, so I guess they cut corners by not including stickers. I got mine around the time Revenge of the Sith was in theaters, so it was new. I don't know if any of the newer versions include sticker sheets. I'm still not very sure of this "Target exclusive" thingy, does that mean it is limited edition? Do yours come with sticker? 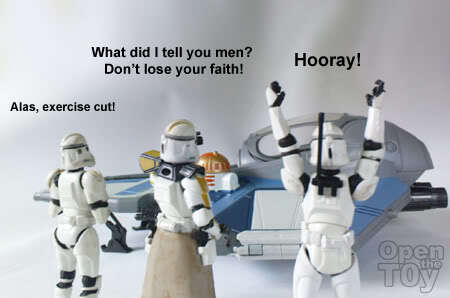 Mine was the Clone war animation version from the box. They were for offers and for that price, it is the closest vehicle I am willing to pay. It's not exactly a limited edition. It just means that Target is the only store that was selling that specific toy. Mine did come with stickers. 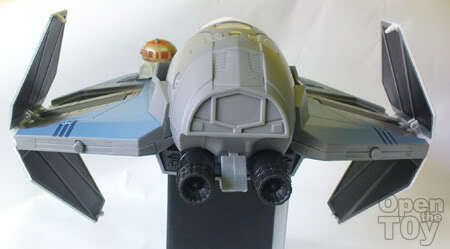 There were some for the inside of the cockpit, and the Republic insignia, and various bullet holes. They probably don't save much by leaving out the stickers, but it is probably enough to make some difference to them. I don't think we'll see any electronics in the smaller vehicles any more. 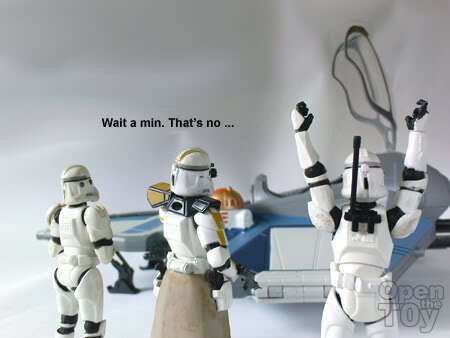 Even my big X-wing doesn't have them. 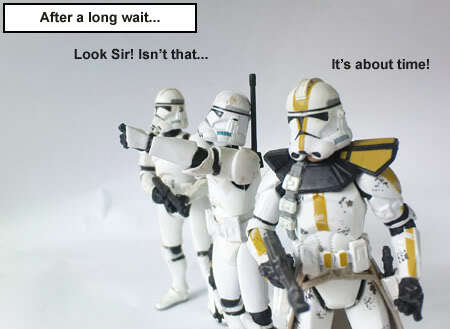 Oh yes the Republic insignia! They are wise no to show any design of the stickers on the box. If you have not asked, I may overlooked that. Great review, I especially like the comic at the end of the review, I wasn't expecting Darth Vader, LOL, I have Obi Wan's version of this fighter. They are pretty cool. 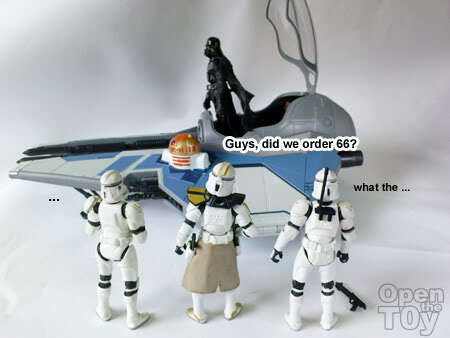 FANTASTIC HAUL bro, though i still love the anakin epi 3 space battle version. 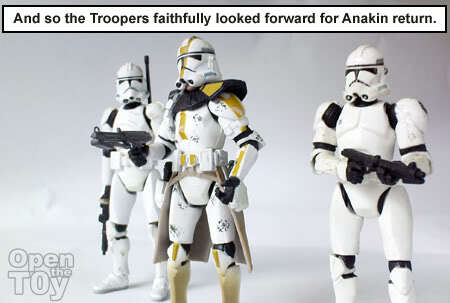 yellow paintwork..
prob with ur anakin is cauz you're not using the right figure...epi3 one from the legacy wave 1 should fix it imho. love the comic to bits...keep it up leon! L, do you plan on getting the whole group? That'll be kind of cool, dontcha think? Btw, I have replied to your tag, do come by and see, bro. Thanks. seems that u like toys a lot..
waahahha...your reviews always great n fun..
btw is aayla secura figure include on this pack?? Thanks Chunky! Glad you enjoy the comic. 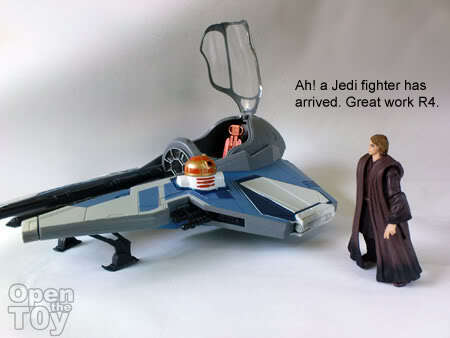 Care to share your Obi Wan's jedi starfighter review with us? Thank you and glad that you enjoy it as well. 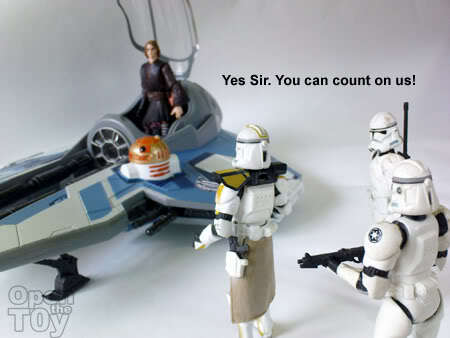 Good price for a Starfighter. Nice comic strip from Anankin to Dark Vader. Great review leon! Such a cool site! And I love your comic LOL!